They say, a way to a woman's heart is through her ... well you can fill in the blanks for me. Let's just say, that my culinary skill has come in handy many a time. I was in a mood, a peculiar mood on this Saturday. Thought I'd start with a quick dinner followed then by a nice girly movie. Wait, were you thinking somthing else ? Don't go there. 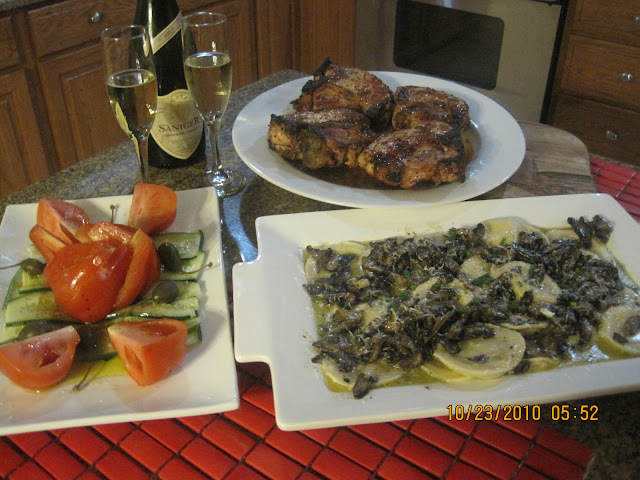 This blog is rated triple G.
Here are my three dishes, two courses followed by desert: pasta, pork goodness and a special salad. There isn't much to this dish . 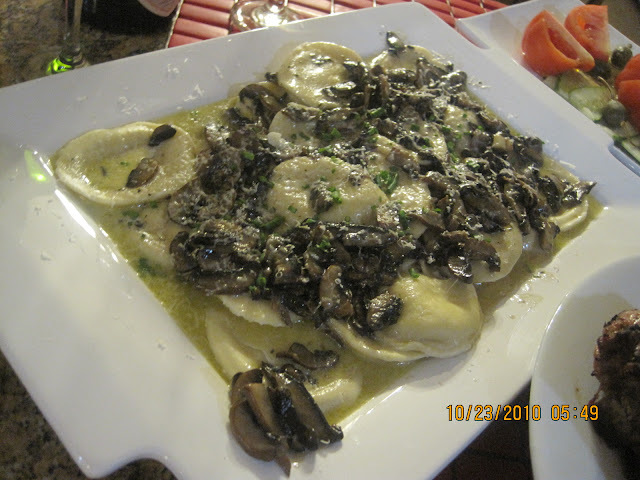 Sautee your favorite mushrooms, use them as toppings for any kind of plain ravioli. I used three cheese fresh ravioli. As mentioned before, I like to freeze the ravioli beforehand. This ensures that I keep them al dente as all pasta must be served. The sauce was made with cremini mushrooms. Make sure, repeat, make sure that the mushrooms are fresh as they tend to become too aromatic, on the negative side if they are not. Top your dish with a freshly grated cheese such a aged asiago. 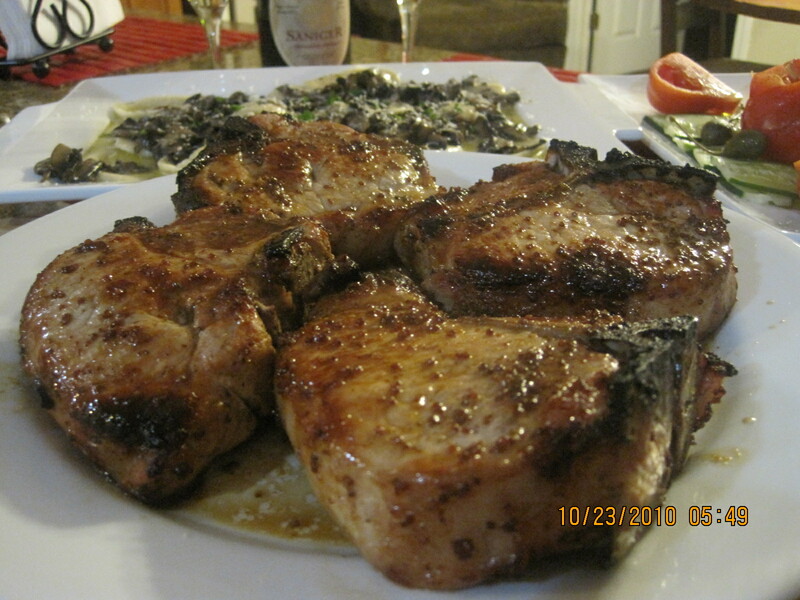 These thick chops were first browned to seal in juices and moistness, then baked with a mustard glaze made with Makers Mark and molasses. . An additional hint of mirin was also added for more sweetness.Grain mustard was used to make it stand out as well counterbalance with some acidity.. The godess also got flowers as the Greeks once prescribed. A bouquet of another kind was offered to the divinity. I sliced the cucumbers longitudinally, layered them in a thick lattice and then seasoned each layer. I topped the cucumbers with pear tomatoes that were cut through radially (too much geometry in this sentence, isn't there?) . Seasoning consisted of EVOO , salt and a very lite drizzle of white vinegar. Caperberries garnished things while adding a bit more flavor. 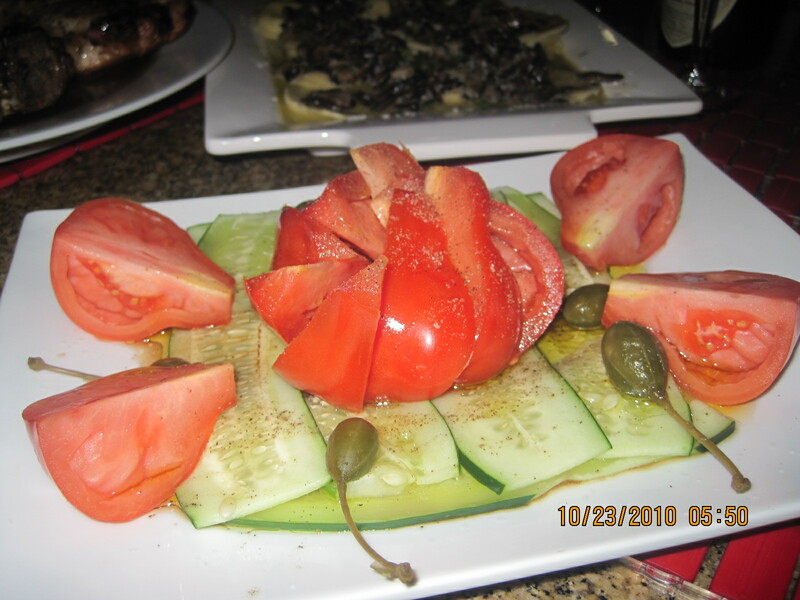 Let his salad sit about 1/2 before serving so that the salt allows some juices and flavor to develop. And of course the finished spread. 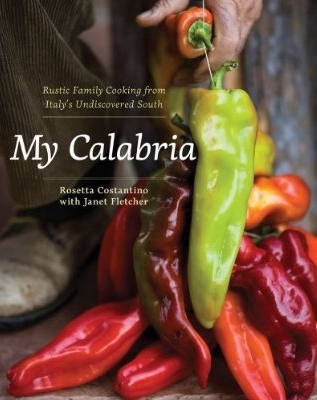 All served with some Italian bubbly, a crispy Prosecco.